Prabarna Ganguly, a science writer at the National Human Genome Research Institute (NHGRI), shares #WhySciWri in this short Q&A. A: I am a staff science writer at the National Human Genome Research Institute (NHGRI), which lies within the umbrella of the National Institutes of Health. I disseminate genomics research performed at NHGRI to various audiences, including the general public, scientists, educators, and students. 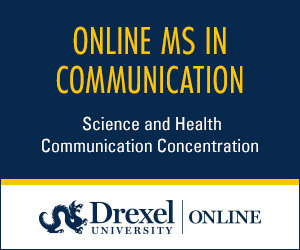 I'm early in my career, having recently graduated from my Ph.D. program in December 2018, and hope to learn and participate in all things sci-comm! A: I always wanted to be a writer. While in graduate school I started exploring ways to combine my academic expertise with my love for writing. I applied to the science communication workshop ComSciCon in 2015 and loved the experience. Thereon, I freelanced for websites such as Oceanbites, Massive Science, and SciShow, and helped start a climate change/environmental science website called Windsor of Change. These experiences cemented my desire to work toward a career in science writing. A: You’ll find me doing one of many things! These include keeping up to speed with the ever-evolving genomics landscape, talking to researchers about their projects and asking their opinions on a plethora of genomics issues, writing stories for genome.gov (our dedicated NHGRI website), and finding ways to expand and enhance NHGRI's science communication portfolio. You will also find me walking along hallways saying hello to colleagues and spending an inordinate amount of time discussing the Great British Baking Show, movies, and The Daily podcast. A: I visit genome.gov daily! Apart from that, it’s a mixed bag consisting of New York Times, Nature, Science, Quanta, and Wired. I think it is necessary to be attuned to the ways in which science is discussed in the news media and other platforms. I always try to remind myself that research does not exist in a vacuum, and our stories should reflect humanity. Q: If you could write about any scientific event/breakthrough/topic (past, present, or future) what would it be and why? A: Apart from biology and genomics, I am also a physics and philosophy geek. At the moment I am obsessed with fundamental constants and would love to write an (admittedly long) piece that describes how the 26 constants enable emergent properties to appear within the universe. A: Since I am relatively new to the field of science writing, I am looking forward to making professional connections. NASW has excellent science writing resources and I will be taking full advantage of them to continue honing my writing skills. But most importantly, I am excited to meet science lovers and keep learning and sharing all things sciencey.